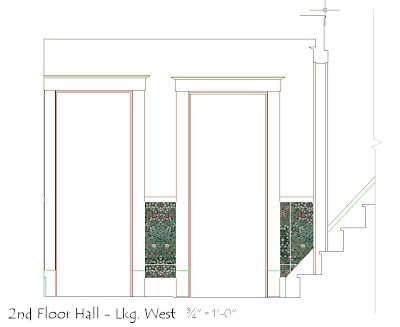 After working on them for the last month and more, I've finally finished drawing up the elevations of my 1st and 2nd floor halls with the dado wallpaper layout. I have a lousy case of bronchitis and feel like something a Humvee ran over. I really should be in bed soothing my brain watching mindless videos. But my student AutoCAD license turns into a pumpkin sometime next month, and everytime I try to sleep with my cough, my dreams turn into torture sessions where I'm trying to finish these drawings or trying to figure out how to calculate the right amount of William Morris "Blackthorn" wallpaper for the dado that runs diagonally up the stairs. Pattern matches and all. So I've been working on it, and as of this evening I've drawn all the elevations I need for the purpose. And I've done my take-offs for the amount of paper needed, two different ways, and have a number I can rely on. So I've gone on the Sanderson's Fabrics site and filled out my order form-- 10% discount for quantity, how nice-- and I'm happy to see that the pound-dollar exchange rate isn't as bad as it has been. At least, not according to their calculator. So now I can push the "Checkout Now" button and see what I'm in for for shipping and handling and get this order in, in, in-- right? Not right. Because after initially being so expeditious with the samples, Sanderson's has dropped the ball for the past five weeks and hasn't sent me the final-approval swatches I asked for in mid-October. Well, maybe they did send them and they got lost in the post. Over the Atlantic. So laryngitis and all, I'm calling Yorkshire tomorrow to see if I can move things along. And maybe while I'm coughing my way through tonight's slumbers, my mind can roil away at something else. I mean the four jamb trim pieces I stripped today. I was really hoping to stop the current paint stripping campaign at the top of the steps from the first floor. It's tacky enough subsisting with my living room, dining room, and first floor hall denuded of trim. It's quite enough to have to overlook the black-dusty-crumbly grossitude that is the exposed plaster where trim once reposed on the walls of the first floor. I really didn't want to tackle the trim of the five doors, one window, and miscellaneous baseboard in the second floor hall as well. Couldn't I restrict the squalor to one floor only? No, I could not. The wallpaper and/or paint that starts in the downstairs hall will have to go all the way up. No stripped trim upstairs, no nice new stairhall walls upstairs or down. 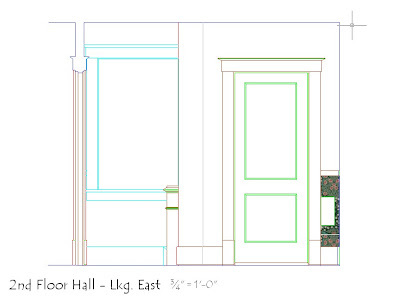 Those five doors, one window, and miscellaneous baseboards had to be done, now. So I'm doing it. The trim of the window and three of the doors I tackled last weekend. Today my goal was to strip that last of the long jamb pieces, the two from the bedroom doorway and the two from the closet. Should have taken me five hours. Maybe six, maximum. Instead, I was at those four nasty pieces of work from shortly after 10:00 this morning till nearly 8:00 this evening, with maybe a half hour out for a mid-afternoon snack. The problem? On the first two, splintery places some previous owner(s) hadn't bothered to glue down before painting them over. Rather, the object seemed to be to get as much paint behind the splinters as possible. You can literally while away hours trying to dig that out. And then, of course, these damaged places need to be reglued. Which they should have been several decades ago. With the third piece, it soon became apparent that it wasn't the original trim. Original to the house, but I think it started out someplace else, someplace where it was painted from the beginning. All except one edge, which was stained and shellacked under the paint. Very strange. There's a story there having to do with the time my POs-1 converted the third bedroom into a dressing room/walk-in closet. But I won't insert my conjectures now. The paint on this piece, even after two laborious, time-consuming attacks with the heat gun and scraper, still wouldn't yield to the liquid refinisher. Had to order in the light artillery and use the palm sander. It now has squiggly sanding marks all over it, but I Do Not Care. It's stripped, that's the point, and I'll deal with the squiggles later. This piece also had a chip that needed glued back in, but it broke in two and the heatgun blower blew one of them onto the floor where it got lost amidst the paint shavings. Oh, Darn. Fourth piece I did this evening only because I finally got the Project Tracker working (with help from Larry at Simpson's Folly) and I wanted to post another percentage point. So there I was out on my screened-in porch at 7:30 PM. It was dark outside, the north wind was rising, the temperature plummeting, the rain was thinking about turning to sleet or even snow, and I was stripping woodwork. I couldn't be sure if the vapor I was seeing was smoke from the work piece or my own breath, and my feet were so cold I had to resist the temptation to turn the heatgun onto my shoes. But I wanted it done. The last jamb piece wasn't as awful as the others: it just had a lot of that old blue wall color ingrained in the outer edge. Lovely pasttime, freezing your fingers with cold refinisher in colder weather. My right shoulder needs the chiropractor, I'm so tired I'm liable to forget I have dinner in the oven, but the nasty things are stripped.
" . . . [H]alfway. A midpoint in any venture is difficult because that's the place where days gone and miles done equal those ahead, and the result is equilibrium, stasis, inertia. A rollercoaster nearly stops just before the last drop to the finish. In some ways, the first mile of the second half is the most crucial because it's the one that propels the traveler down the slope of endurance to destination. . . . "
Thus sayeth William Least Heat-Moon in his book River Horse: A Voyage Across America. Mr. Heat-Moon was in the middle of navigating America's rivers via a C-Dory, a canoe, and miscellaneous other craft from the Atlantic Ocean at the mouth of the Hudson River to the Pacific at the mouth of the Columbia. I'm in the middle of stripping my house's woodwood piece by paint-covered piece from the dining room on the first floor to the hallway on the second, taking in the living room, front room, first floor hall, and the staircase on the way. A couple hours ago I stripped piece No. 168. That's 50% of my 336 piece tally. Halfway. Half done. "While we were still some miles shy of being exactly halfway, I knew I had already emotionally arrived there. So I dragged up onto my feet, doleful, depressed, dejected, disgruntled, dissatisfied, dissipated, discouraged, disheartened, downcast, and otherwise down at the mouth, and I went into the damp, dreary, dismal day drooping, despondent, disconsolate, and damnably in the deep doldrums." Well, it is undeniably dreary today in southwestern Pennsylvania. After a week of lovely Indian summer weather, today it's gray, cold, and soggy, and if the temperature got above 50 degrees it was a wonder. It was not fun to go out on the back porch and strip woodwork. The wind was blowing. My feet were freezing. If it hadn't been for the heatgun, I coulda got frostbite! I have every excuse to fall into the halfway doldrums. How do I know I won't? Because I went ahead and stripped piece No. 169! I'm over the top! I'm on the drop to the finish! I'm descending the downward slope of endurance to my destination! And oh, yeah, I've also put off doing the front room with its 60 to 70 trim pieces until that dim, distant day when the dining room, the living room, and the stairhall from bottom to top are done, done, done-- trim, wallpaper, floors (as needed), and all. Wonderful how encouraged you can feel when you can delude yourself about the true magnitude of the job. Random Rightbrain Thoughts . . .
. . . Why is there so much spackle-filler stuck on the door and window trim pieces? Are the gaps between them and the jambs really that yawning? . . .
. . . Did my POs-1 really paint their kitchen trim battleship gray? . . .
. . . Could I hire out and do this for a living? . . .
. . . 139 done, 197 to go . . .
. . . There's a sweetsy smell off this paint when I go at it with the heatgun . . . Lead? Or just the foam insulation igniting? . . .
. . . Look at all these dings and depressions . . . steam them all out? Get away with wood putty? Maybe I can just say the piece is "aged" . . .
. . . I can put the trim back up to minimize those gaps-- can't I? . . .
. . . Hold back the winter, Indian summer, I'm not sure if I can take the snow . . .
. . . Nah, I make too many boo-boos. And wouldn't the demand be down "in these economic times"? . . .
. . . Will dark garnet shellac be enough to recover the original tone of the wood, or will I have to stain all these pieces? . . .
. . . Those stair balusters that back up to the wall, I really don't want to strip them in place . . .
. . . Clear silicone sealant after it's all back up and shellacked. Unless the gaps are too wide?
. . . What if I get the stain color wrong and have to redo a piece? . . .
. . . 142 done, 194 to go . . .
. . . John Jacob Jingleheimer Schmidt, that's my name, too . . .
. . . Oh, crap! Did I just run the belt sander over its own cord? . . .
. . . Well maybe, if it turns out beautifully, I could post pictures and advertise . . .
. . . Maybe somebody on the Houseblogs site can tell me how to take my stair rail apart without destroying it? . . .
. . . Good grief, look at the condition of those jambs! What happened there?? Glad I'm not the one who perpetrated that . . .
. . . Go in and out the window, go in and out the window, go in and out . . .
. . . 145 done, 191 to go . . .